Eye, Retina - Normal in a female F344/N rat from a chronic study. 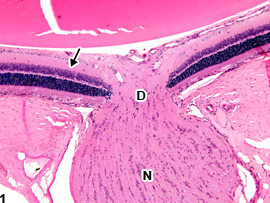 Normal retina (arrow), optic disc (D), and optic nerve (N) for comparison to Figure 2. Eye, Retina - Gliosis in a female F344/N rat from a chronic study. There are increased numbers of glial cells in the nerve fiber layer (arrow), optic disc (D), and optic nerve (N). Retinal gliosis ( Figure 2 , compare to normal in Figure 1 ), the proliferation of astrocytes, Müller cells, and/or microglia, can occur in various retinal layers with focal to diffuse distribution. It is characterized by increased numbers of glial cells in the retina. Retinal gliosis can occur as a primary change (generally of uncertain etiology) or as a feature to other retinal lesions (e.g., degeneration). When occurring as a primary change, retinal gliosis should be diagnosed and assigned a severity grade. When retinal gliosis occurs as a morphologic feature or reactive sequela of another pathologic process (e.g., retinal degeneration), it should not be diagnosed separately (unless warranted by severity), but should be described in the pathology narrative. Adams ET, Auerbach S, Blackshear PE, Bradley A, Gruebbel MM, Little PB, Malarkey D, Maronpot R, McKay JS, Miller RA, Moore RR, Morrison JP, Nyska A, Ramot Y, Rao D, Suttie A, Wells MY, Willson GA, Elmore SA. 2011. Proceedings of the 2010 National Toxicology Program Satellite Symposium. Toxicol Pathol 39:240-266. Brooks DE, Komàromy AM, Källberg ME. 1999. 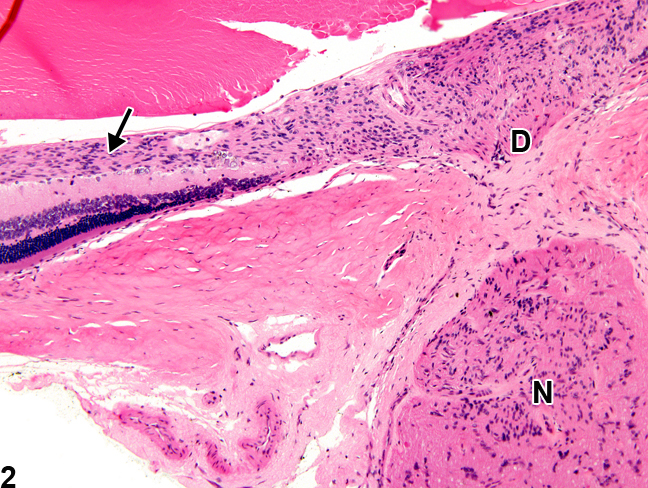 Comparative retinal ganglion cell and optic nerve morphology. Vet Ophthalmol 2:3-11. Ho G, Kumar S, Min XS, Kng YL, Loh MY, Gao S, Zhuo L. 2009. Molecular imaging of retinal gliosis in transgenic mice induced by kainic acid neurotoxicity. Invest Ophthalmol Vis Sci 50:2459-2464. Jung HJ, Raine CS, Suzuki K. 1978. Schwann cells and peripheral nervous system myelin in the rat retina. Acta Neuropathol 44:245-247. Langmann T. 2007. Microglia activation in retinal degeneration. J Leukocyte Biol 81:1345-1351. Yanoff K, Zimmerman LE, Davis R. 1971. Massive gliosis of the retina. Int Ophthalmol Clin 11:211-229. Zeng H, Zhu X, Zhang C, Yang L-P, Wu L, Tso MOM. 2005. Identification of sequential events and factors associated with microglial activation, migration, and cytotoxicity in retinal degeneration in rd mice. Invest Ophthalmol Vis Sci 46:2992-2999.